Checkpoint therapy has now revolutionized cancer treatment and fundamentally changed the way how cancer can be managed. 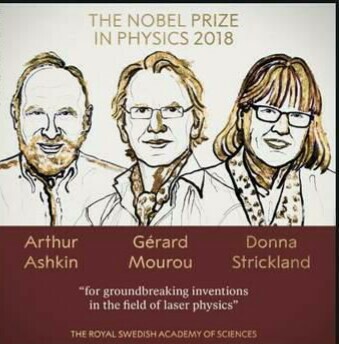 The physics prize honours researchers for discoveries in phenomena as enormous as The Big Bang and as tiny as single particles of light. Ashkin, of the U.S., was awarded the half the prize, and Mourou and Strickland, of France and Canada, respectively, were jointly awarded the other half. 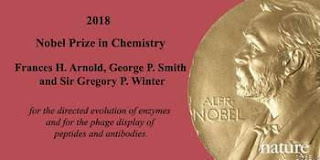 The $1.01 million prize, which can be shared by as many as three people, is decided by the Royal Swedish Academy of Sciences. The Royal Swedish Academy of Sciences has awarded the 2018 Nobel Prize in Chemistry 2018 with one half to Frances H Arnold and the other half jointly to George P Smith and Sir Gregory P Winter for their work in evolution and phages. The methods developed are now being internationally developed to promote a greener chemicals industry, produce new materials, manufacture sustainable biofuels, mitigate disease and save lives. Denis Mukwege is a gynecologist who has treated victims of sexual violence in the Democratic Republic of Congo. 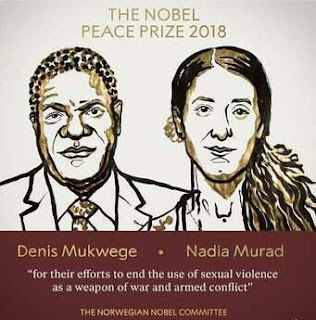 Nadia Murad is a Yazidi human rights activist and survivor of sexual slavery by Isis in Iraq. Sometimes an empty chair can speak volumes. The Senate Select Committee on Intelligence intentionally set up an unoccupied seat to shame Google parent company Alphabet at Wednesday's hearing on foreign meddling in the 2016 U.S. presidential election. The committee wanted either Alphabet CEO Larry Page or Google Chief Executive Sundar Pichai to testify alongside Twitter CEO Jack Dorsey and Facebook COO Sheryl Sandberg, but the company offered its top lawyer and senior vice president of global affairs, Kent Walker, instead. That decision rankled committee leaders Sen Mark Warner, D-Va., and Sen. Richard Burr, R-N.C., who rejected the substitution, hence the pointedly vacant chair. "I'm disappointed Google decided against sending the right senior level executive," Burr, the chair of the committee, said in his opening remarks. Warner, vice chair of the committee, echoed Burr's statement. "I'm deeply disappointed that Google — one of the most influential digital platforms in the world – chose not to send its own top corporate leadership to engage this committee," Warner said. Facebook and Twitter have said that they took too long to tackle foreign campaigns to meddle in US elections. Responding to lawmakers, Facebook's chief operating officer Sheryl Sandberg said the social network was "too slow" to act on election interference. Twitter's chief executive Jack Dorsey said his platform was "unprepared and ill-equipped" for the "weaponisation" of debate.Google did not show up to the Senate Intelligence Committee hearing. Opening the hearing, Democratic senator Mark Warner said he was "deeply disappointed" that Google "chose not to send its own top corporate leadership". The senate committee focused on what the technology giants were doing to prevent future election meddling. It followed claims that Russia and other foreign actors spread misinformation and propaganda ahead of the 2016 presidential election. "With the benefit of hindsight, it is obvious that serious mistakes were made by both Facebook and Twitter. You, like the US government, were caught flat-footed by the brazen attacks on our election. Even after the election, you were reluctant to admit there was a problem," said Mr Warner. He warned that the social networks could face new regulations. "The era of the wild west in social media is coming to an end. Where we go from here is an open question," he told the hearing. Samsung's head of mobile has said it is "time to deliver" foldable smartphones, fuelling speculation the company is about to reveal a bendable device. In an interview with CNBC, DJ Koh said Samsung's consumer research suggested there was demand for a foldable phone. Several phone-makers are rumoured to be developing devices with flexible screens that can be folded in half, without a hinge or seam in the middle. However, Samsung told the BBC it did not currently have "anything to share". Twitter chief executive Jack Dorsey has told US law-makers that the company's algorithms have not always been "impartial". But he was unable to immediately say whether a majority of them were Republican, Democratic or otherwise. Mr Dorsey is being questioned by senators over allegations that Twitter censors conservative voices. However, he said the company had made mistakes. On Wednesday, the US Department of Justice said it would investigate "growing concern that these companies may be hurting competition and intentionally stifling the free exchange of ideas on their platforms". Mr Bezos said: “We will have to leave this planet. We’re going to leave it, and it’s going to make this planet better. We’ll come and go, and the people who want to stay, will stay. The Earth is not a very good place to do heavy industry. It’s convenient for us right now. But in the not-too-distant future — I’m talking decades, maybe 100 years — it’ll start to be easier to do a lot of the things that we currently do on Earth in space because we’ll have so much energy. Mr Bezos is looking to utilise the full potential of his space exploration company Blue Origin to establish a lunar base. The billionaire says that his company will look to work with the likes of NASA and the European Space Agency to help colonise the moon. Studies have shown that establishing a base there will be relatively easy as it is close to home, and contains large bodies of water beneath the surface which could be used to help create fuel. 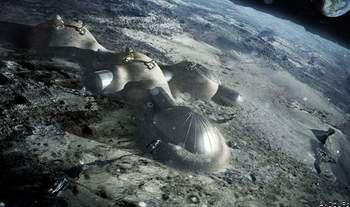 He explained further: "The Moon Village concept has a nice property in that everybody basically just says, look, everybody builds their own lunar outpost, but let’s do it close to each other. That way, if you need a cup of sugar, you can go over to the European Union lunar outpost and say, ‘I got my powdered eggs, what have you got?' Obviously, I’m being silly with the eggs, but there will be real things, like, ‘Do you have some oxygen?’"
On 15 June 1752, American political and scientist, Benjamin Franklin went outlook to fly a kite, instead of choosing a nice , sunny afternoon, Franklin chose a stormy one in the hope that the dark clouds overhead could become a lighting storm. The scientist successful extracted sparks from the clouds proving his theory that lighting was electricity. He survived his dangerous experiment unhurt, from the famous scientists who have since died from lighting strikes while performing similar experiments. Electricity has immense power, capable of both lighting storms and boiling kettles, powering an entire city and giving light to a torch. Electrical power is everywhere -it's just there, meeting our every need, every time we turn on light switch or open the fridge, use our mobile phone or watch a film. It's even there when we make a friend's hair stand on end with a balloon we have just rubbed on a jumper. In Acts 2:1-21 we read about the day of Pentecost when the Holy Spirit came and filled the disciples, giving them power, courage and amazing gifts. Just as electricity is everywhere, ready to power the things we need, so the Holy Spirit is with us whenever we needed him as a source of power and comfort. As we invite the Holy Spirit into our lives , we are given the power we need to live the Christian life. a. Robert Boyle (1627 - 1691). He is regarded as the Father of Chemistry. He is famous for his discoveries on the physics of gases. b. Marcello Malppghian (1628 - 1694). He has been referred to as the ‘Father of Microscopy’. This is because of his numerous anatomical and botanical investigations with the newly invented microscope. The malppghian layer in leaves of plants is named after him. c. Christian Huygens (1629 - 1695). He was a reputed mathematician and an astronomer. He built the first accurate pendulum clock. d. Robert Hooke (1635 - 1703). He made his living as a surveyor and an architect. He was a research assistant to Boyle. 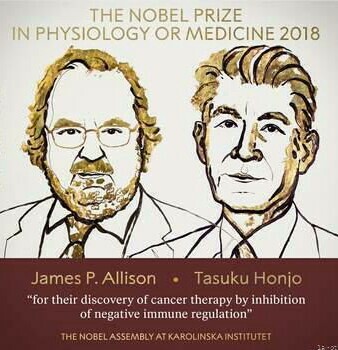 He carried out various researches in biology and physics. He is most remembered for his microscopic discovery of the cells of plants. e. Isaac Newton (1642 - 1727). He was a brilliant mathematician and physicist. He is remembered mainly for his laws of motion, and the discovery of the composite nature of white light using a sunbeam and a prism. f. Michael Faraday (1741 - 1867). He was a brilliant physicist. He is remembered for his discovery of electricity in 1813 during a series of deliberate researches with very simple apparatus. On the other hand, the production of steam power, a technical development is the most important in the whole history of modern industrial civilisation. This technical production proceeded without any help from pure or basic science. The original incentive for this invention was cormcmlyercial and industrial. That is how to solve the problem of pumping water from a mine. The only significant contribution form theory was the invention of separatedcondenser in 1764 by James Watt (1736 -1819). Apart from this the steam engine was invented and improved by a succession of practical inventors without any training in mathematics or physics. Invention is an outstanding feat emanating from science and technology. The claim is often made that modern industry depends on basic science for its supply of innovations. It is also said that the support of pure science is justifiable because it would lead, eventually to economic benefits through improved industrial products or processes. For instance, the zip used to fasten a piece of clothing, especially women’s dresses was invented by W. L. Judson. He was an American mechanical engineer. He applied for the first patent of his invention in 1891. (The patent is an open letter from the government of a country, conferring the sole right for a period of time to make, use or sell some invention.) Judson’s invention was a unique one. He formed a company to try to make and market a saleable product. But the company failed after a period of twenty years. It took another company called the Automatic Hook and Eye Company and a Swedish electric engineer called G. Sundback (1913) to improve and finally come up with the essential design we know today. But public acceptance of this new product only came in 1918. Another notable invention was that of antibiotics. The invention was a technical innovation that sprang directly from pure or basic scientific research. In 1928, Alexander Fleming accidentally observed the effects of microorganisms (fungi) named Penicillium on a bacterial culture. He was deeply interested in natural products that could kill bacteria. He immediately started research on the penicillium phenomena. Over a period of three to four years, he extracted the active agent in the fungi, tested its action on animals and humans. He found out that it was not toxic to animals and humans. He published his results in a journal. But because Fleming was a man who didn’t like publicity, his discovery was almost completely ignored. Again, he didn’t have the money to isolate and purify the active agent for commercial purposes. Additionally, he didn’t seek publicity because commercial pharmacists of that time generally considered the concept of a non-toxic bactericide, a contradiction. Ten years later in 1939, a group under Howard Florey and Ernest Chain began work on natural antibiotics. They came across Fleming’s paper in the literature and soon confirmed Fleming’s work that penicillin was highly effective.